Garfield Dice Rush is a brand new board game, featuring popular characters; Garfield, Odie, Arlene, Jon, and many more. In this game, you choose one of your characters and play with other players. The goal is simple; you have to reach the last tile before other players. Garfield Dice Rush game also features card system; a wide range of cards can be inserted into the deck and you can use these cards as an obstacle for other players. In this post, we have covered everything about the game you need to know; Garfield Dice Rush guide, tips, cheats & strategy to top the leaderboard. In the game, the player who reaches the last tile first wins the match and get gold and rank points as a reward. You just have to roll the dice, use the skill cards at the right time, and take advantage of tiles; red tile, warp doors, wheel of fortune, and more. Using the best strategy, you can easily win all the matches; apart from it, you have to upgrade your skill cards and character’s level. 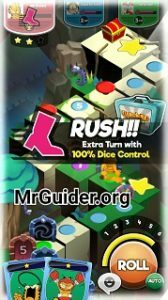 Let’s start the Garfield Dice Rush guide and after it, check out our Dice Rush tips, cheats & strategy. As of now, this Garfield game features 13 characters. At the beginning of the game, you have Garfield and rest characters are locked. How to unlock new characters? To unlock new characters, you need character cards. For instance, to unlock Gentleman Jon, you need 2 Gentleman Jon cards. These cards can be obtained by opening the lunchboxes, you get by winning matches and free as a reward. The attributes of each dice are different. You can unlock new dice by opening the lunchboxes or from the shop. And to upgrade a dice, you need duplicate cards. For instance, to upgrade Wood dice to level 4, you need 10 wood dice cards. The tutorial also covers “how to use cards”. All you need to tap on a card at the start of your turn and then hit on use button. These skill cards used to move ahead of other players and to move back other players. For instance; “Kick” is a skill card, can be used to force a random enemy to go back 2”4 tiles. As of now, this game features over 90 skill cards. You can select up to 8 cards for the match(on the basis of deck points) and in the match, you hold up to 3 cards at a time but you can use only one card at a time. To unlock these cards, open the lunchboxes or go to the shop and there you can obtain skill cards in exchange for coins. How to add stars or upgrade skill cards? High-tier cards are better than low-tier cards. You can upgrade or obtain a high-tier card using fusion feature. Go to the deck side -> tap on card fusion -> select the duplicate cards and fuse to get a high-tier skill card. Duplicate cards? For instance; you have two kick cards. You can use duplicate kick card in fusion. Before the match starts, the player has to pick a card; this card decides the turn; 1st, 2nd, and 3rd. To get the first turn, choose the card instantly; chances are you will get the first turn if you choose the lottery card first. Then you have to roll the dice; press and hold the roll button until the meter reaches the number that you want. For instance, It’s my turn and on the 4th tile, there is a bag of gold. To grab that bag, I should press and hold until the meter reaches number 4. However, it’s not necessary that you will always get the desired number. It all depends on your luck and dice’s attribute(upgrade dice to increase the chances of getting the desired number). Before you roll the dice; take a look at the map; the map is full of cool things; for instance, landing on a spring tile will make you jump forward instantly. Wrap doors can move you forward as well as reverse. Wheel of fortune; where your luck determines the reward. After analyzing the board, stop the dice meter on your desired number. For instance; If the wheel of fortune is on the 5th tile from my current position and I want to land there, I should stop the dice meter at number 5. Traps; There are also traps. For instance; wrap doors; these doors can take you to forward tiles as well as backward. Keep away with wrap doors which can move you back. In short, analyze the next tiles and stop the dice meter on an appropriate number. At the start of your turn, you can choose one of your skill cards. And you should choose it wisely. If you don’t have knowledge about skill cards; then before you start the match go to deck tab and tap on a skill card and read what this skill card do in the match. Using skill cards blindly is harmful. So, use it wisely. For instance, “Small Lasso” is a great skill card; using this card, you can swap your position with the closest enemy in front within in 6 tiles. If you use this card, you will be swapped with an enemy position. For instance, an enemy is on the last 3rd tile and you are just 2 tiles away from him. Using this card, you can swap your position with him. Go to the deck tab and select the best cards. At the top-left corner, you can see your rush meter. Each time you roll the dice, it increases on the basis of the number you got. Once it’s full, you will enter rush mode; an extra turn with 100% dice control and immunity; it means you will definitely get your desired number upon rolling the dice. To activate it fast, get high-number; 6, 5, 4. After you win the match, make sure you to open the lunchbox. To improve performance in the matches, upgrade your character, dice, and skill cards. You can earn free coins and gems by watching the video ad. Fuse duplicate cards to get a high-tier card. Go to the shop tab and claim your free lunchbox. You can also buy skill cards from the shop in exchange for coins.